Good bye ho-hum roasted pumpkin seeds. I’ve made them, and made plenty. It’s not that they were bad, but they were never the things dreams were made of. Fear not, because pumpkin seeds roasted on the Char-Broil Big Easy ARE the thing dreams are made of. They are perfectly crunchy, but not over-done. They are tasty, but not over-seasoned. They’re just… great! If you prefer to flavor your seeds, do so after you’ve roasted them. Do it pretty much immediately after you remove them from your Big Easy. As they cool they won’t ‘take’ the seasoning as well. I felt that these seeds were absolutely perfect with just a little salt! To make things easier, you'll need a bunk bed basket. Line your Bunk Bed basket with foil. This will make a nice little 'bowl' for your seeds. Alternatively you can line the bottom of the Big Easy basket with foil but I find the basket to be easier. Plus, you can fit two Bunk Bed baskets in the Big Easy at once. Clean the pumpkin seeds. Remove all of the pulp then transfer them to a colander and rinse well with water. Drain. Bring the water to a boil and stir in the salt. Add the seeds and reduce to a simmer and continue simmering for 10 minutes. Drain well and transfer to a bowl. Drizzle the seeds with just a few splashes of oil. Don't add much, less is more. Transfer the seeds to the oil-lined basket and place inside the Big Easy. Roast for 10-15 minutes. Do not let the seeds get brown, they will burn easily. They will just start turning golden and they are done. You can actually reach in (carefully) and grab one or two for testing as they roast. Remove and dump the basket into a bowl and sprinkle lightly with more salt. 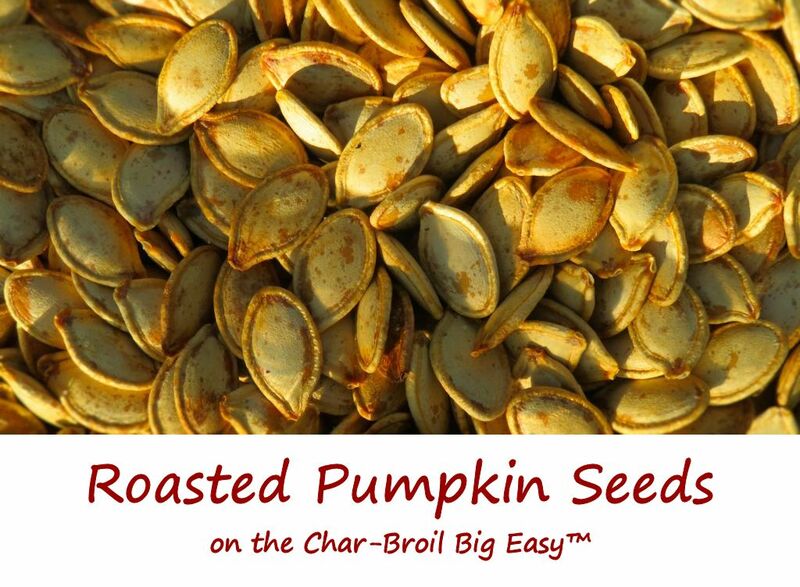 This entry was posted in From the Char-Broil The Big Easy™ and tagged char-broil big easy, recipe, roasted pumpkin seeds, Roasted Pumpkin Seeds on the Char-Broil Big Easy by Mike. Bookmark the permalink.